AAS Objeq by Applied Acoustics Systems DVM Inc. Desktop AU/VST developer Applied Acoustics Systems DVM Inc. joins the realms of iOS with the release of AAS Objeq! 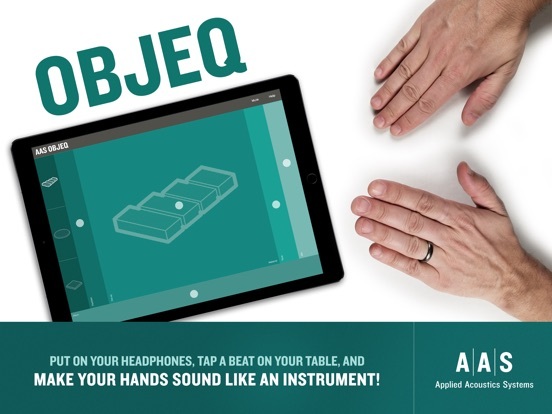 This AUv3 app lets you slap your hands on a surface and turn those sounds into real instruments. And impressively so at that! Check out the demo video below. This is a worthy competitor to Impaktor. It's like a very stripped down version of Chromatic, where all the cool bits are stripped out. What's left is somewhat similar to Impaktor, at least in terms of sounds. But Impaktor had more going for it in terms of variety and layering. Some people love those stripped down Zen-like UIs.